I have a degree in Graphic Design:Illustration from the University of Plymouth and I’ve been a freelance illustrator since 2006. My life drawings and paintings have been exhibited regularly at local galleries since the year 2000. 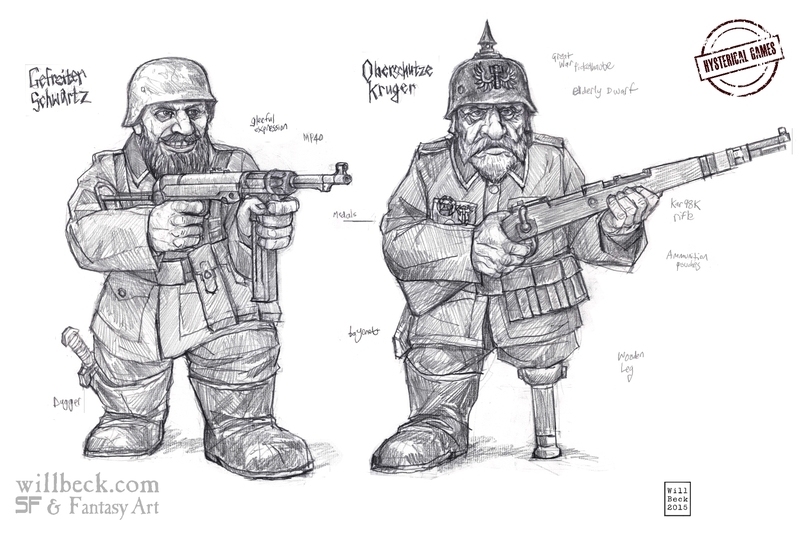 Lead concept artist on Hysterical Games’ ‘Panzerfäuste’ miniatures wargame. Provided concept drawings for a Kickstarter for a range of Science Fiction wargames or roleplaying games miniatures with a retro feel. First wave was successfully funded within days. My name is Jeremy Unitt, and I am currently in the process of writing a science fiction/fantasy novel series in desperate need of an illustrator. At the moment, I am only looking for interested artists, and if you are, please send an email with your rates or post on the Facebook page so we can talk. Hi, looking for an artist to draw up a Norse themed tattoo sleeve for me, let me know if your interested, thanks. You are the man ! Love your drawings, you’re a great inspiration. I’m going to start carrying a sketchbook around with me again and get out my colored pencils ! Looking for a artist for drawings for a miniature line. Thanks Michael! e-mail me will@willbeck.com with your brief and time scale required. At the moment I am working on four miniatures-related projects. I found out about you via colony 87, I was really impressed by your sketchbook work, looks awesome. I’m interested in something similar. Potentially I would like to commission you to do sketch book work that we can use for social media interest posts amongst other things. Would love to chat more and get in contact. Many thanks John, if you would e-mail me will(at)willbeck.com we can chat more!